A blood filled pimple is usually caused by trauma done to the skin, such as squeezing or pinching a pimple. The trauma, according to Lymphedema People, ruptures the underlying blood vessels, causing the pimple to pool with blood and lymph fluid. Blood filled pimples should never be popped or squeezed and instead should be allowed to heal naturally. Opening the pimple before it has healed can spread bacteria to other areas of the skin, which can cause infection. Wash the blood filled pimple and surrounding areas with an antibacterial soap twice a day. Always wash with a clean cloth and pat the area dry with a new clean washcloth, to prevent the spread of bacteria. Be careful not to touch the affected or surrounding areas, which also can promote the spread of bacteria that can cause a serious infection. If you begin to experience signs of infection, such as a fever, or redness around the pimple or pus, see your doctor for antibiotic treatment. Apply a topical antibiotic cream to the pimple, twice a day, 15 minutes after cleansing. Use clean hands to apply a thin layer to the affected and surrounding areas in a circular motion. Antibiotic cream, available at your local pharmacy, can help the pimple heal faster and also prevents the development of bacteria that can cause an infection. If the blood filled pimple should rupture prematurely, continue to cleanse and apply antibiotic cream to the area. Hold an ice pack, wrapped by a clean towel, on the affected area for five minutes twice daily. According to Treat Blisters, you should check the area for redness. If no redness appears, apply the ice for another five minutes and continue this procedure for a half an hour. Applying ice helps decrease pain and inflammation, relieving pressure caused by blood pooling inside the pimple. Apply a small bandage to the blood filled pimple. This can help prevent accidental trauma that can open the pimple, exposing it to dirt and bacteria. 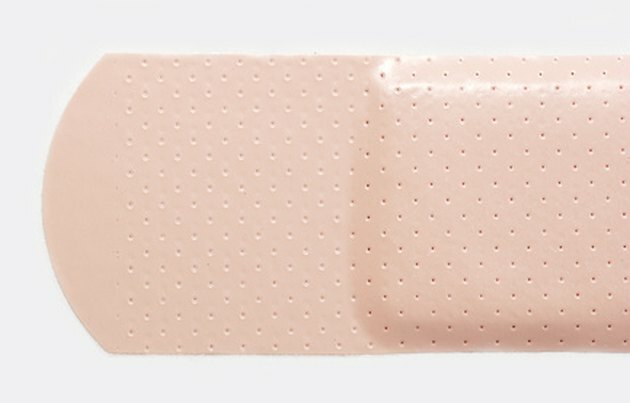 If the pimple appears in an area that isn't suitable for a bandage, apply a small piece of adhesive silicone bandage, available at your local surgical supply store. Silicone is transparent and can help keep bacteria away from the pimple without making it more noticeable. Never touch a blood filled pimple or attempt to puncture it, as this can cause infection and significant scarring. What Are the Dangers of Popping Pimples?